Detroit, Michigan — In March 2014, the Detroit Water and Sewerage Department (DWSD) announced it would begin shutting off water ser­vice for 1,500 to 3,000 customers every week if their water bills were not paid, and yesterday, the City Council approved an 8.7 percent water rate increase. According to a recent DWSD document, more than 80,000 residential households are in arrears. With thousands of families now without water, and thousands more expected to lose access at any moment, a group of concerned organizations have submitted a report to Catarina de Albuquerque, the UN Special Rapporteur on the Human Right to Safe Drinking Water and Sanitation, urging authorities to take immediate action to restore water services and stop further cut-offs. 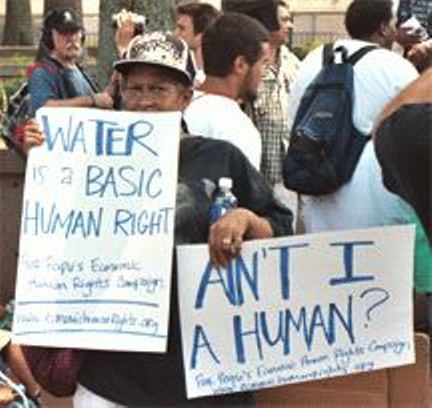 The report was released by the Detroit People’s Water Board, the Blue Planet Project, the Michigan Welfare Rights Organization and Food & Water Watch. 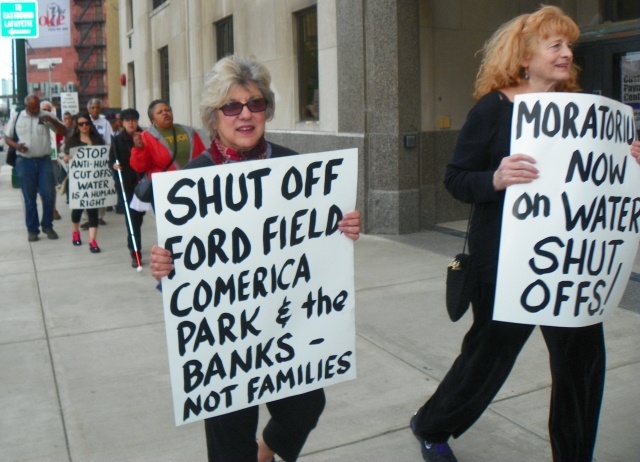 First Freedom Friday protest against mass Detroit water shut-offs in front of Detroit Water Board building. Over the last decade, Detroit residents have seen water rates rise by 119 percent. With unemployment rates at a record high and the poverty rate at about 40 percent, Detroit water bills are unaffordable to a significant portion of the population. Many of those affected by the shut-offs were given no warning. The infirm have been left without water and functioning toilets, children cannot bathe and parents cannot adequately prepare food for their families. 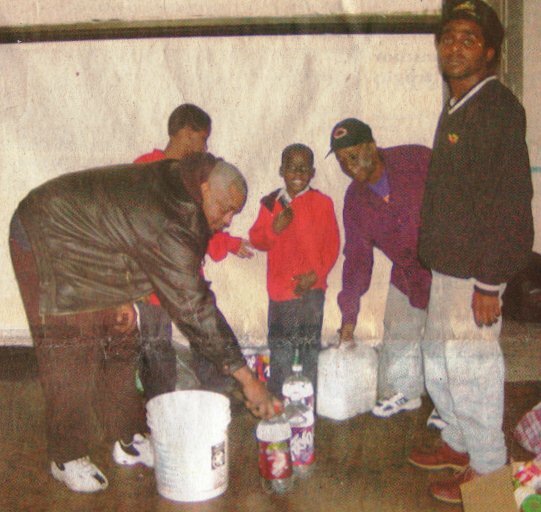 “When delinquent corporate water lines are still running without collection of funds, it demonstrates a level of intentional disparity that devalues the lives of the people struggling financially. Where is our compassion? Where is our humanity?” asked Lila Cabbil, President Emeritus of the Rosa Parks Institute. In 2013, Detroit declared bankruptcy and appointed Kevyn Orr as emergency manager, giving him a mandate to get the city back on its feet financially. Orr has since taken steps to privatize the DWSD, and many now believe that the water shut-offs are an attempt to appeal to potential investors. In the Great Lakes region, large, private water companies charge households on average more than twice as much as rates charged by comparable publicly-controlled systems. Moreover, private operation has been linked to poor service, workforce reductions, maintenance backlogs, water leaks and sewage spills. We call on the State of Michigan and the U.S. government to respect the human right to wa­ter and sanitation. We call on the city to restore services to households that have been cut off immediately. We call on the city to abandon its plan for further cut-offs. We call on the federal and state governments to work with the city to ensure a sustainable public financing plan and rate structure that would prevent a transfer of the utility’s finan­cial burden onto residents who are currently paying exorbitant rates for their water ser­vices. 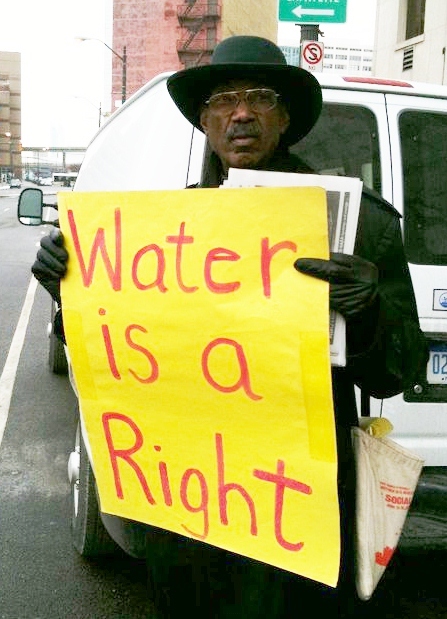 We call for fair water rates for the residents of Detroit. We call on the City of Detroit to implement the original water affordability program. People’s Water Board members protest earlier outside Water Board Building. The Detroit People’s Water Board is a coalition that includes AFSCME Local 207, Detroit Black Community Food Security Network, Detroit Green Party, East Michigan Environmental Action Council, Food & Water Watch, FLOW, Great Lakes Bioneers Detroit, Matrix Theater, Michigan Emergency Committee Against War & Injustice, Michigan Welfare Rights Organization, Rosa and Raymond Parks Institute, Sierra Club and Voices for Earth Justice. The coalition advocates for access, protection, and conservation of water and promotes the human right to water. The late Tashi Kiya at protest. The Blue Planet Project is a global initiative that works with organizations and activists around the world to promote water as a human right and a commons. This includes working with local organizations and activists on grassroots struggles to protect democratic, community control of water, and building a movement to see the full implementation of the human right to water and sanitation. The Blue Planet Project is affiliated with international networks including Friends of the Earth International, Red Vida (the Americas Network on the Right to Water) and the People’s Health Movement. Food & Water Watch works to ensure the food, water and fish we consume is safe, accessible and sustainably produced. So we can all enjoy and trust in what we eat and drink, we help people take charge of where their food comes from, keep clean, affordable, public tap water flowing freely to our homes, protect the environmental quality of oceans, force government to do its job protecting citizens, and educate about the importance of keeping the global commons – our shared resources – under public control. The Michigan Welfare Rights Organization fights for, and represents, the victims of poverty. We organize to eliminate poverty and to stop the war against the poor. We are working with people to deal with the current water crisis in the City of Detroit by advocating for low income people to demand fair treatment, registering complaints against the Detroit Water and Sewerage Department (DWSD), organizing protests and the DWSD offices and Detroit local government buildings, alerting people to resources – when available – to help with their water bills, and speaking out on the human right to water in the media and at public events.